JNF Chairman presents deed to land of Kfar Etzion to residents of Gush Etzion, 100 years after purchase of land. 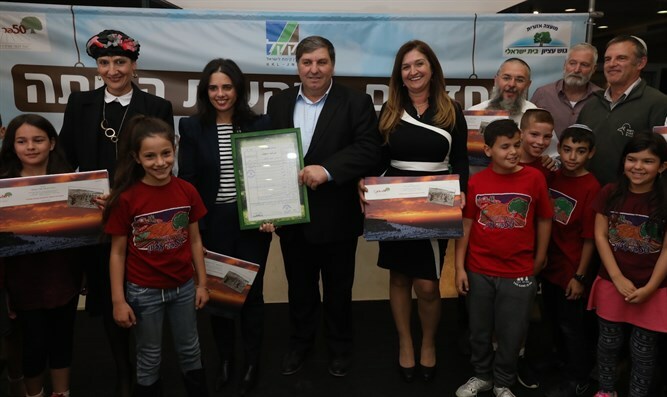 Jewish National Fund (JNF) Chairman Daniel Atar presented the residents of Gush Etzion with the land registry deed Wednesday. With the gesture, the State of Israel officially recognize's the community's ownership of the land of Kfar Etzion. The event took place 100 years after the JNF first purchased the land, 69 years after the Jordanian army ethnically cleansed all Jews from the area, and 50 years since the reestablishment of the Jewish presence in Gush Etzion. "The registration of the land of Kfar Etzion as the land of the Jewish National Fund is an important step, both symbolically and practically, in order to continue our hold on Gush Etzion and the Land of Israel," said Justice Minister Ayelet Shaked. "We would all be happy, of course, if the move had been completed before, but there is no more fitting or appropriate time than this, on the 50th anniversary of our return to the Gush, to Kfar [Etzion], and to Jerusalem," she added. "I am hopeful that the day is not far off that we will be able to advance another step of expression of this belonging: to apply full Israeli sovereignty over all the areas of Gush Etzion, as well as Ma'aleh Adumim and Area C," Shaked added. JNF Chairman Daniel Atar stated that "as a member of the Labor movement, I know the close and deeply rooted connection between the Labor movement and its leaders with Gush Etzion. I have mentioned this more than once, and I will also mention it now, precisely because there are quite a few people in my camp who, under the cover of the passage of time, are trying to blur this fact and are perhaps even ashamed of it." "I am proud of this connection and I am not ashamed to say that," added Atar. "The KKL-JNF management, together with its dedicated employees, will continue to cooperate with the Zionist enterprise in the State of Israel. We will continue our work for Zionist education, settlement, narrowing the gaps in Israeli society, promoting the periphery and all that will ensure the strength of the State of Israel as a democratic state with a Jewish character. " MK Shuli Mualem (Jewish home), a resident of Gush Etzion, said that "19 years after the fall of Gush Etzion, Kfar Etzion was the first settlement established in Judea and Samaria and was the spearhead of the settlement movement. The dream of reestablishing [what was lost] here was carried out in full cooperation with the JNF, and the return of the lands of Kfar Etzion and to Tabu would be a growing factor in all settlement activity and the application of sovereignty in Judea and Samaria, and Gush Etzion will be the first [step towards sovereignty]."